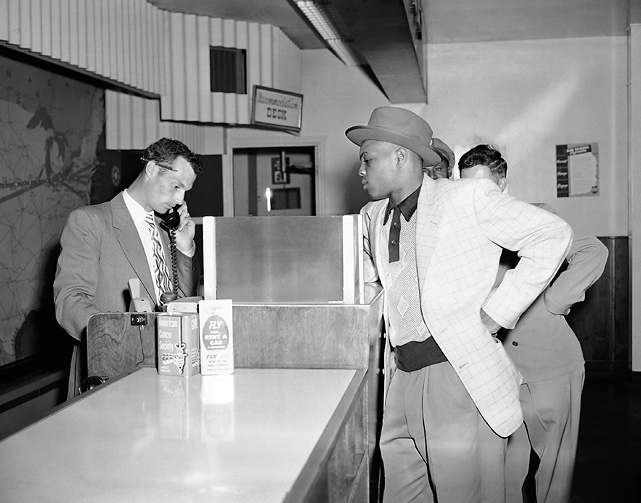 After terrorizing minor league pitching, Mays gets his ticket from Omaha, Neb., to New York to join the Giants in May 1951. He hit .274 with 20 homers and 68 RBI during the year and won the Rookie of the Year award. 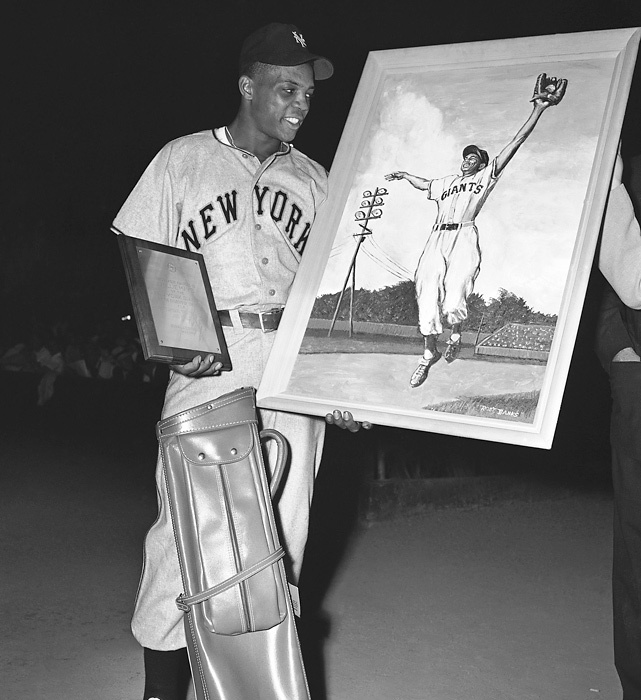 Mays signs autographs at a New York Giants exhibition game in Oakland on March 21, 1952. Mays is sworn in as a private at the U.S. Army induction center in New York City on May 29, 1952. 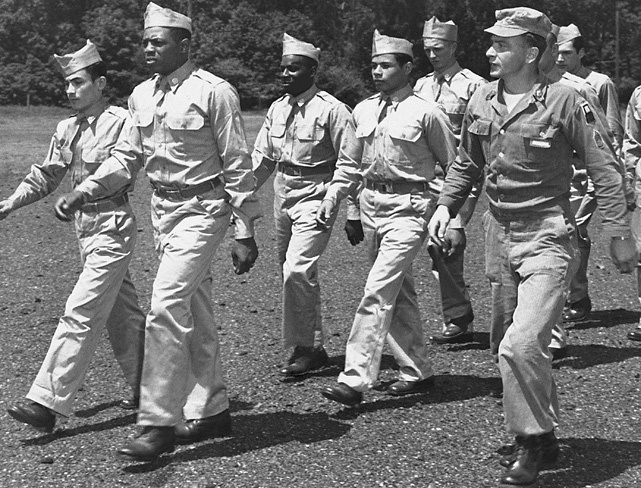 Mays marches during a drill at Camp Kilmer, N.J., in June 1952 as he prepares to be shipped to his basic training site. After winning the Rookie of the Year award in 1951, Mays was drafted into the army and missed most of the 1952 season and all of 1953. 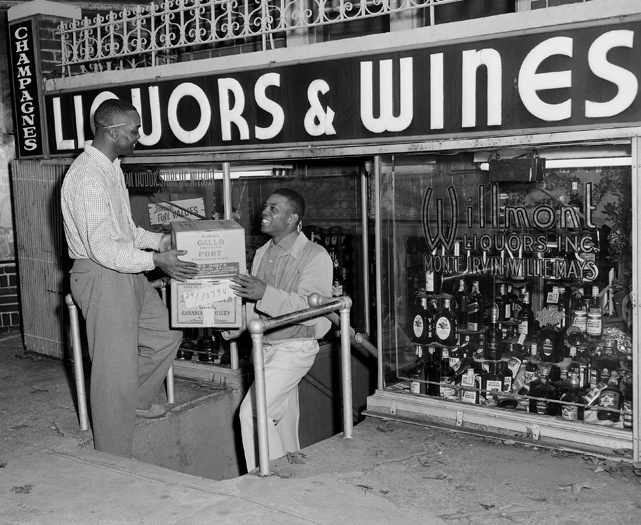 Giants outfielder Monte Irvin hands liquor boxes to Mays in front of their Willmont Liquors, Inc. store in Brooklyn. 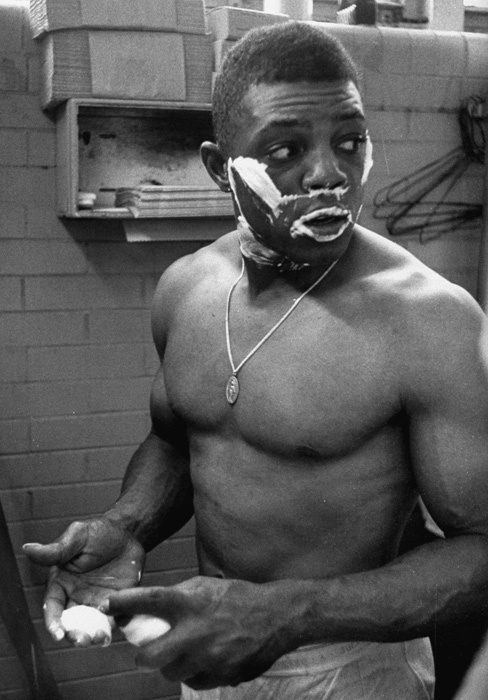 Mays shaves in the locker room during the 1954 season. He won the NL MVP award that year, after hitting .345 with 41 homers and 110 RBI. 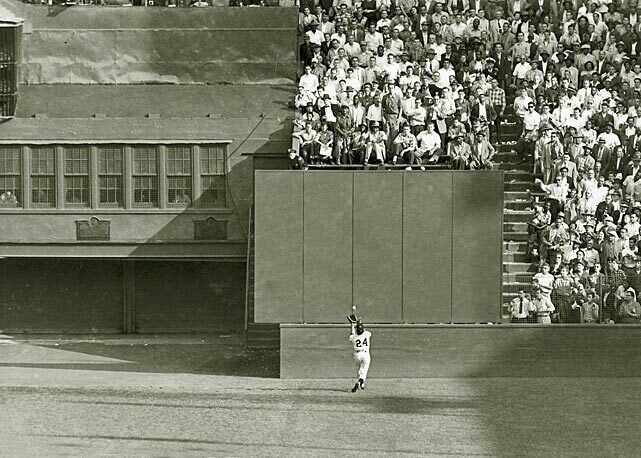 Mays amazes centerfield fans with a leaping, one-handed catch of Duke Snider's long drive in 1954. Mays makes his iconic over-the-shoulder catch deep in center during the eighth inning of Game 1 of the 1954 World Series. The catch preserved a 2-2 tie and allowed the Giants, who swept the series, to win the game in the 10th inning. Mays on the April 11, 1955 cover of SI with celebrity actress Loraine Day Durocher and manager Leo Durocher during spring training. Substituting a cowboy hat for his baseball cap and winding up a lariat, Mays takes a breather from practice at training camp in Phoenix on March 10, 1955. The Giants centerfielder autographs baseballs in the Giants dressing room after a game with Milwaukee was rained out in September 1956. During that season, Mays hit .296 with 36 homers. He also led the league with 40 stolen bases. Mays gets attention from Giants trainer Frank Bowman at the Polo Grounds in New York on May 26, 1956. Mays was struck as he walked into a pre-game warm-up session between Al Dark and Daryl Spencer. Mays shows some of the gifts he received from fans in Trenton, N.J., before a game there. After signing with the Giants, Mays was assigned to their Class-B minor league affiliate in Trenton. He hit .353 in his time there. Mays' wife, Marguerite, feeds him soup while his dog Pope licks his hand during spring training in 1957. Mays missed a day of practice with a virus. Mays and Marguerite married in 1956 but divorced approximately six years later. 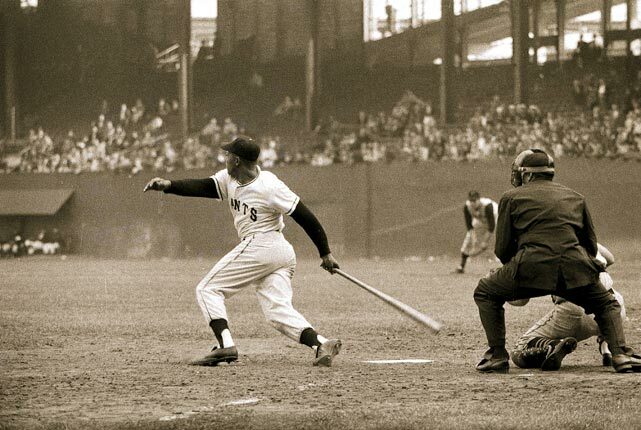 Mays finishes his swing in this 1957 photo. 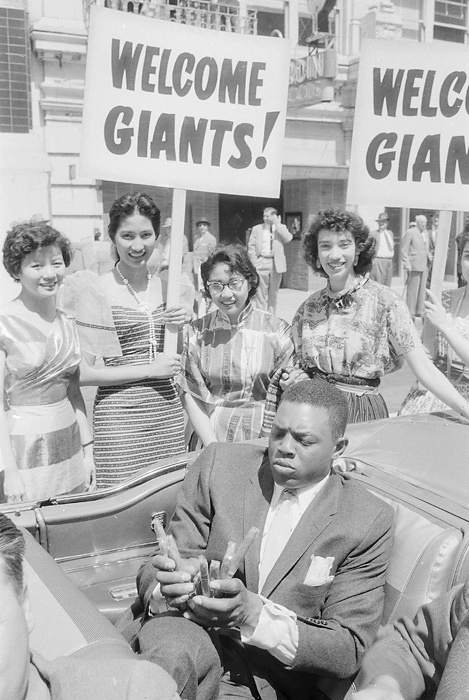 Mays rides in a convertible during a parade down Montgomery Street on Opening Day of the Giants' first season in San Francisco. 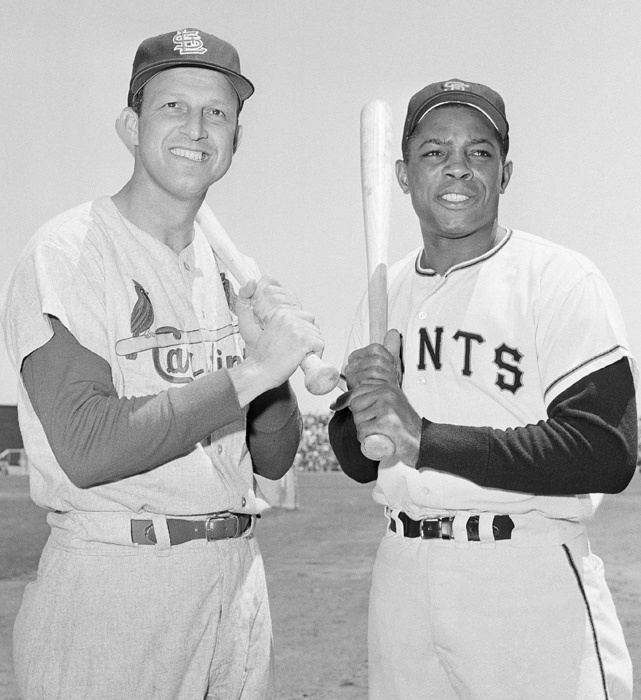 Stan Musial and Mays pose for a photo before their game on July 5, 1958. The pair were first and second in the NL batting race at the time. Richie Ashburn of the Phillies eventually passed both to win the batting title with a .350 average. Mays finished second (.347) and Musial took third (.337). 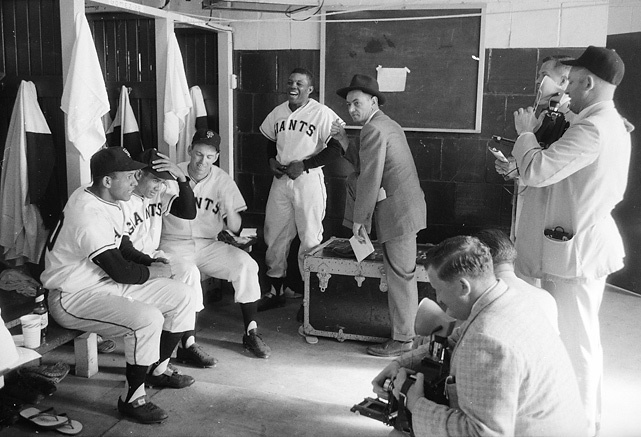 Mays and his teammates chat with reporters before the Giants' inaugural game in San Francisco in 1958. 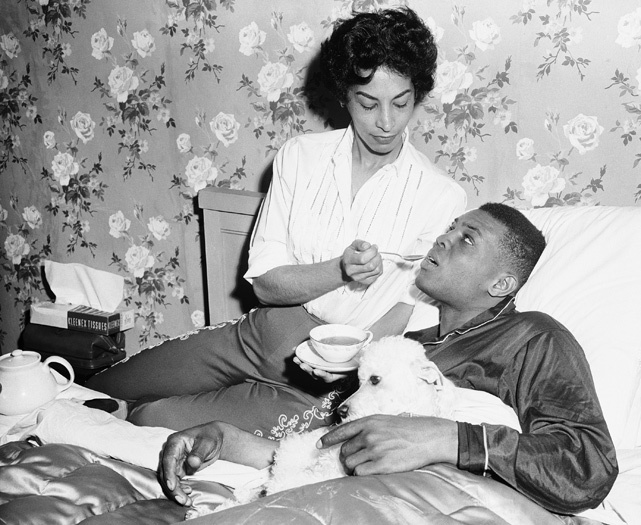 Mays rests at home after he had 35 stitches taken in his leg, March 19, 1959. 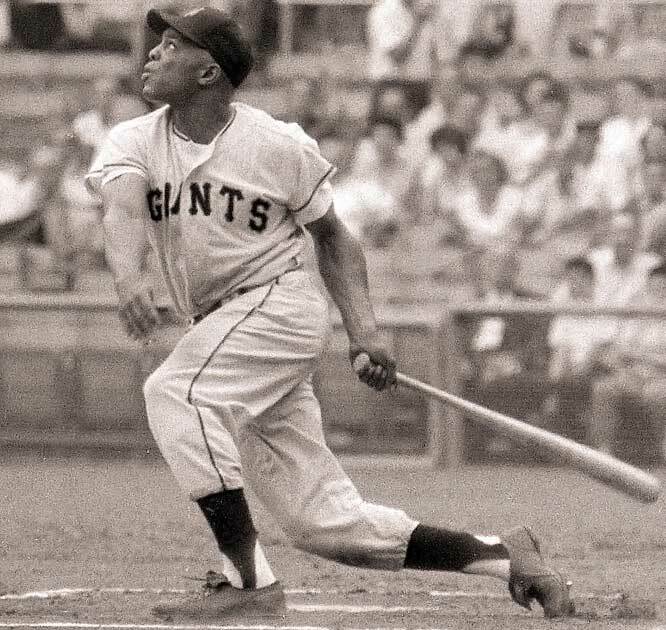 Mays split his leg open when he slid into home plate during an exhibition game between the Giants and Boston Red Sox. Mays lets out a yell as Dr. Jim Thorpe applies an antiseptic to a cut on his hand, which he sustained while trying to hit baseballs out of Wrigley Field, Nov. 24, 1959. Mays and Mickey Mantle were making a pilot film for possible television use in which they try to out-slug each other. 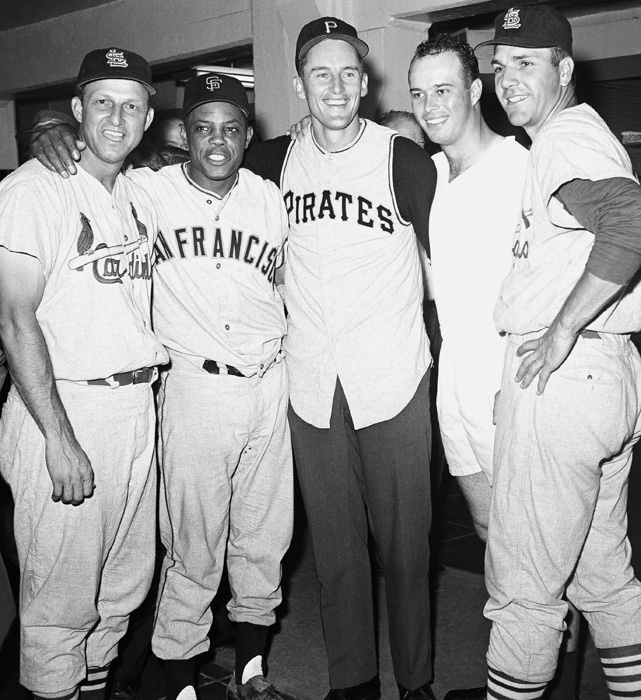 Mays poses with Stan Musial, Vernon Law, Ed Mathews and Ken Boyer after the National League won the 1960 All-Star game 6-0. Law was the winning pitcher and the four each hit home runs to help in the effort. 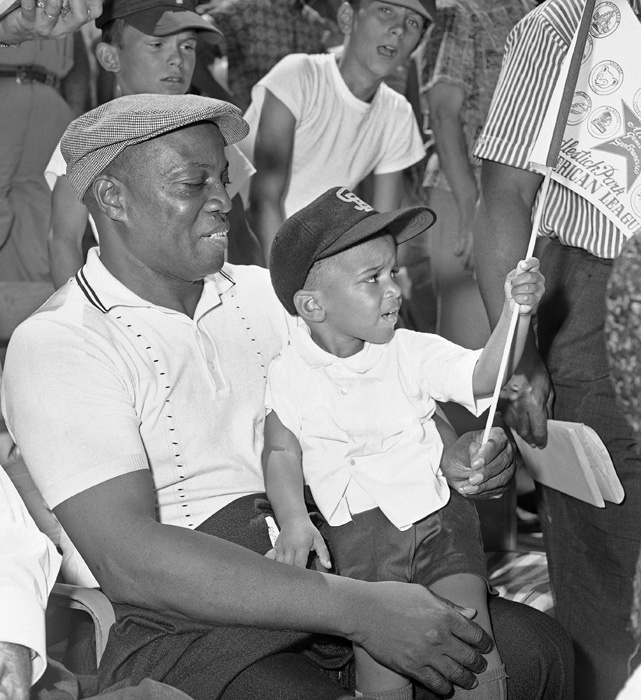 The legendary baseball player's father, Willie Mays, Sr., holds the ballplayer's adopted son, Michael Mays, at the 1961 All-Star game. Mays was playing in his seventh of 20 straight All-Star games that year. 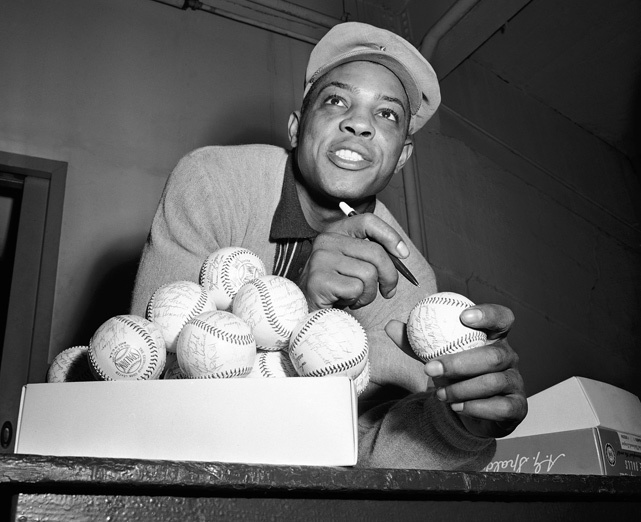 Mays proudly displays the four baseballs in the clubhouse representing the four homers, which he hit April 30 1961 against the Milwaukee Braves in Milwaukee. The four homers tied the record of four homers in a single game held by nine other major league players at the time. After three days of tests at Mt. Zion Hospital in San Francisco, Mays was pronounced healthy in November 1962. The outfielder checked himself in to make sure his fainting spell two months earlier came from exhaustion and nothing more serious. 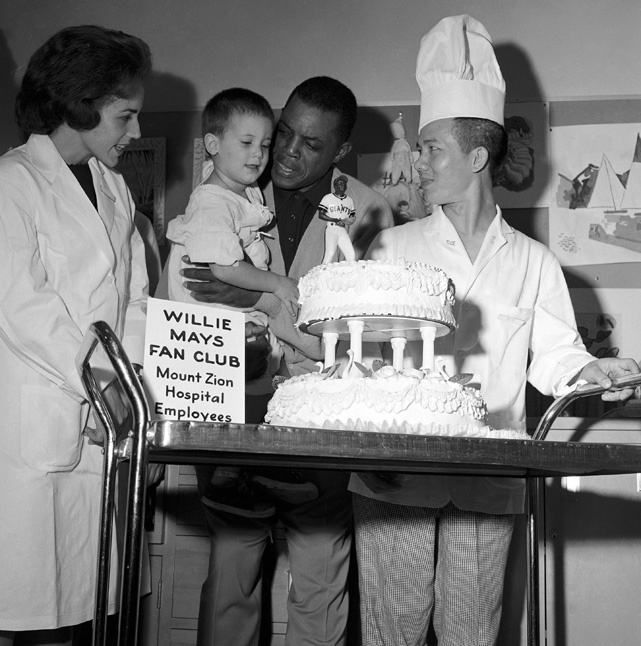 The hospital's Willie May Fan Club presents him with a cake before he checks out. San Francisco Giant Willie Mays with New York manager Casey Stengel during a May 1963 game at the Polo Grounds. 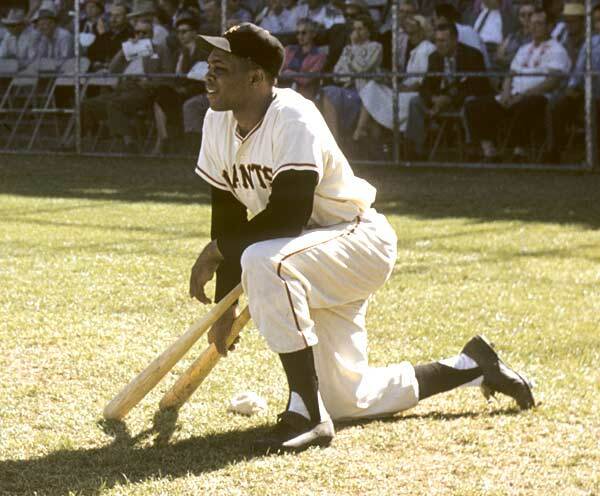 San Francisco traded catcher Ed Bailey to Milwaukee and the following day outfielder Willie Mays put on the backstop togs. He was wearing the mask and protectors for his role on the Donna Reed Show in December 1963 in which he plays himself and teaches would-be ballplayers something about catching. Mays takes part in a demonstration at the Red Cross Volunteer Swim Aide School in 1964. He helped show children the proper technique for CPR. Mays slides into home as the plate umpire calls him safe during a 1965 game. 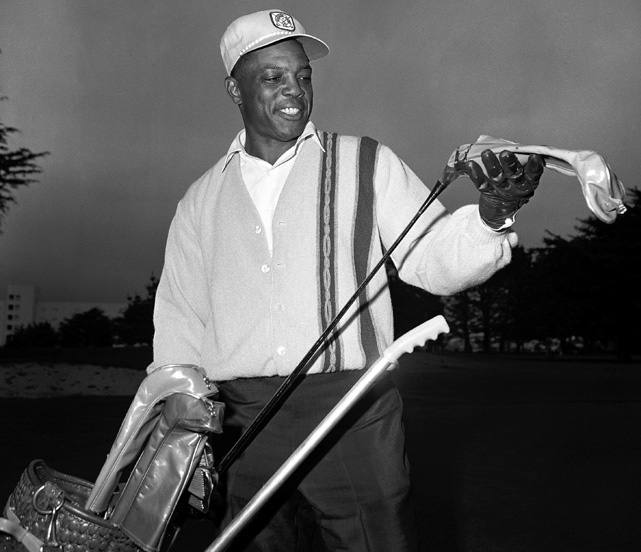 After winning his second MVP award, the Say Hey Kid hit the links for a quick round of golf. Mays was on every ballot cast after hitting .317 with 52 home runs and 112 RBI in 1965. 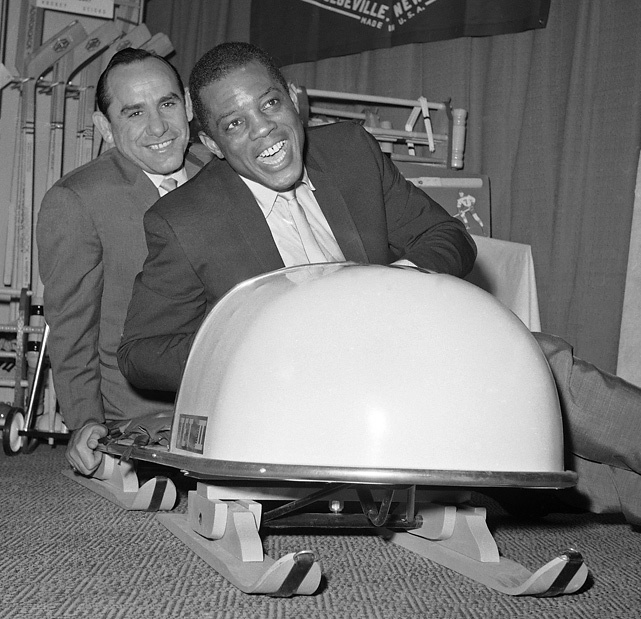 Mays and Yankees legend (and then Mets coach) Yogi Berra try out a new bobsled at a sporting goods fair at the Hotel New Yorker in 1966. Mays breaks the National League record for home runs when he hit his 512th round-tripper in May 1966. 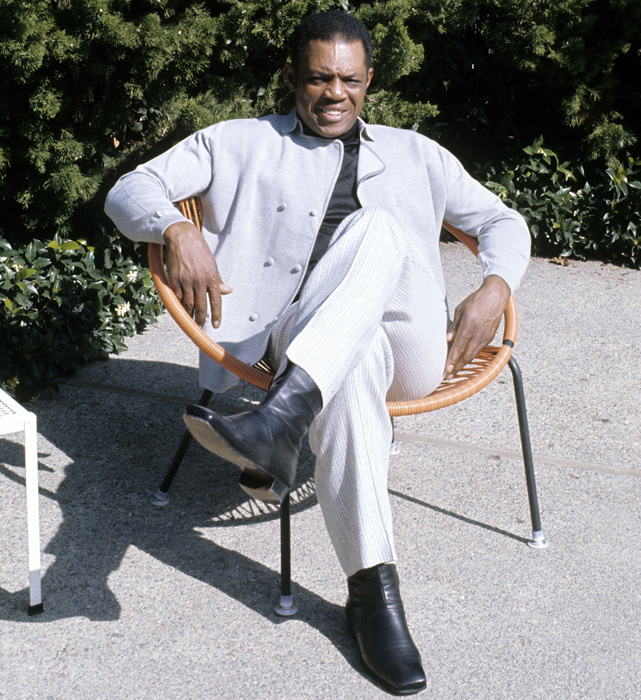 Mays sits back and poses for a photograph late in the 1960s. Mays, licks his fingers after cutting his 37th birthday cake given to him by Judge Roy Hofheinz just before the game with his Houston Astros, May 6, 1968. The 569-pound cake, one pound for each of Mays' home runs, contains 3,800 eggs, 150 pounds butter, 150 pounds sugar, 300 pounds flour, and 100 pounds of almonds. The cake is in the figure of 24, Mays' uniform number. Joining Yankee legend Babe Ruth, Willie Mays became the second major leaguer to hit 600 home runs when he went yard on Padres hurler Mike Corkins in the Giants' 4-2 victory on Sept. 22, 1969. 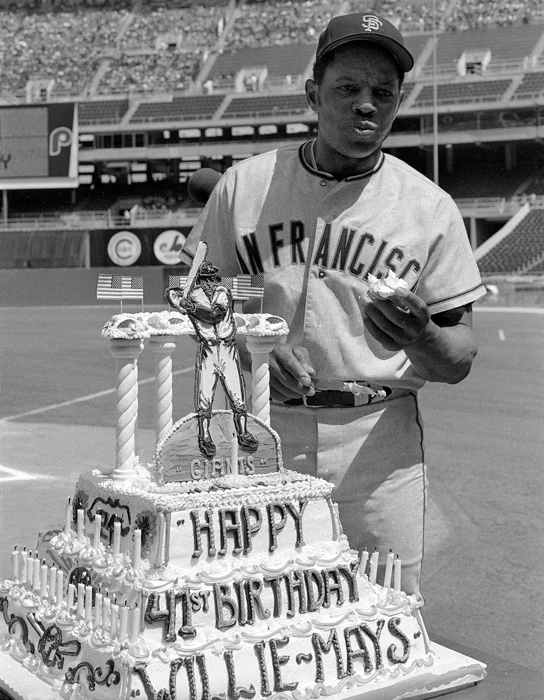 Mays eats part of the birthday cake presented to him before the start of a game with the Phillies on May 6, 1972. The outfielder was traded to the Mets a week later. 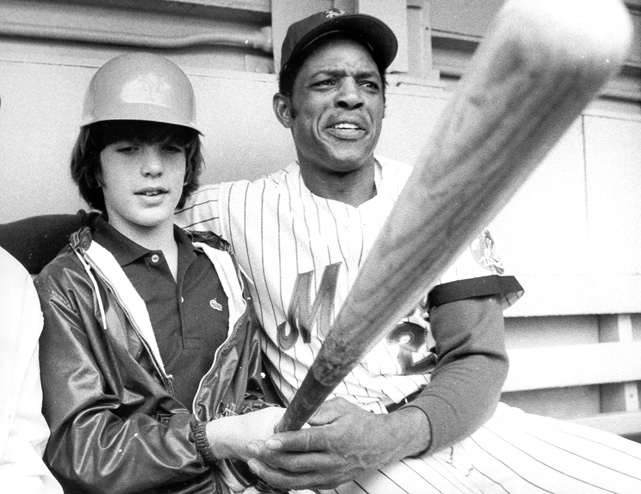 Mays and John F. Kennedy, Jr., pose for a photo outside Shea Stadium in 1972. Mays had been traded to the Mets less than three weeks earlier. 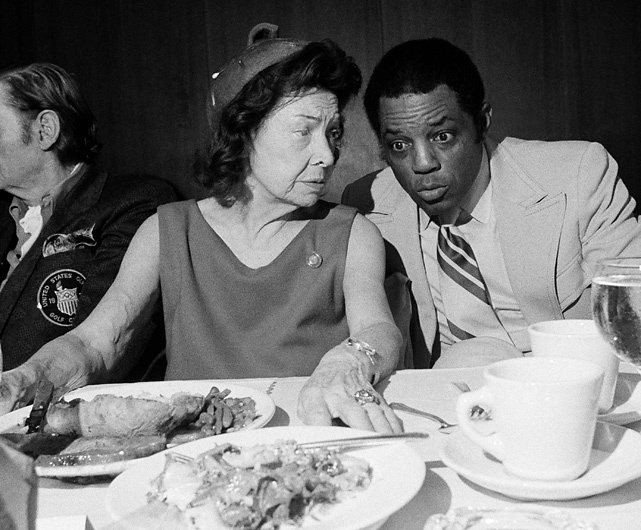 Mays sits with Claire Ruth, the widow of Yankees' legend Babe Ruth, at a 1972 luncheon honoring players featured in the book, "Sports Immortals." When Ruth was asked how she felt about Hank Aaron closing in on her late husband's all-time home run record, Mays whispered to her, "Don't worry, Mrs. Ruth. No one will ever take the place of the Babe." 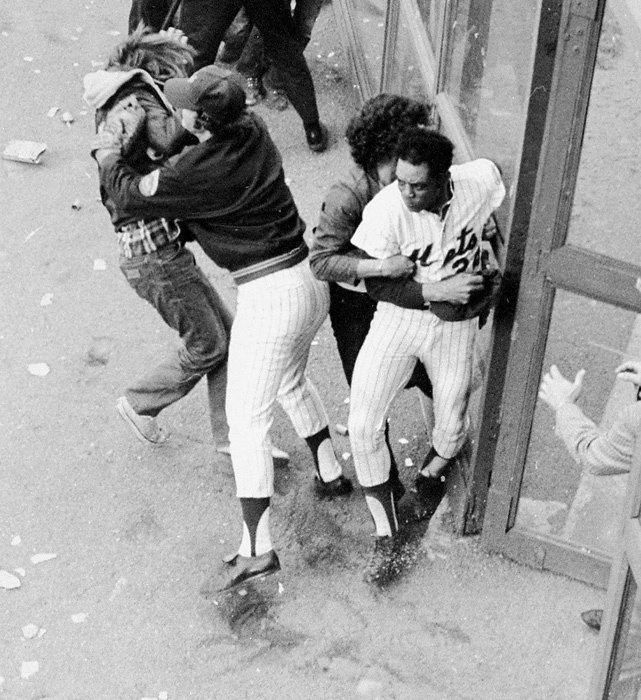 A fan grabs Mays in right field as another player from the bullpen grabs a fan at Shea Stadium on Oct. 10, 1973. Mays is doused with champagne at Wrigley Field on Oct. 1, 1973, after his Mets defeated the Cubs 6-4 to take the National League East division championship. Mays had announced his retirement with the end of the baseball season. Mays talks to Tonight Show guest host Burt Reynolds on July 15, 1974. 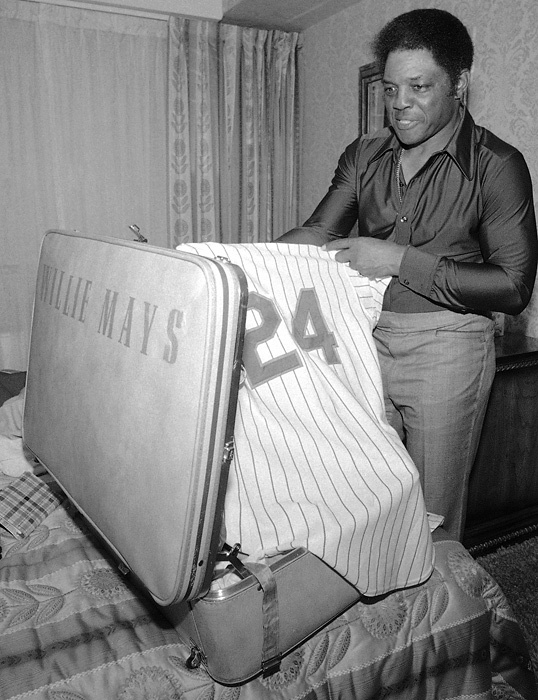 Mays packs for spring training in his apartment in Riverdale, N.Y., in February 1977. After retiring in 1973, Mays worked for the Mets as a hitting instructor. Mets outfielder Lee Mazzilli and manager Joe Torre listen to Mays talk about outfield defense in February 1978. 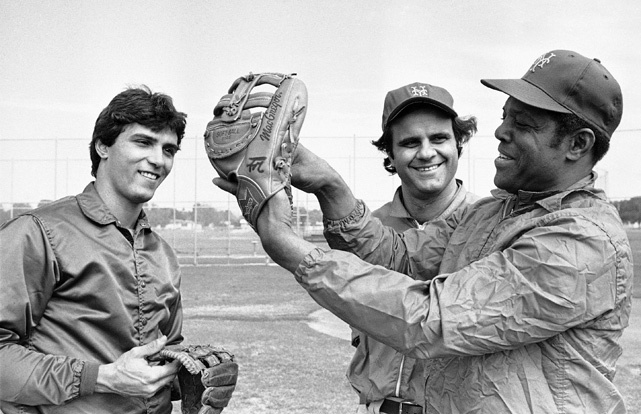 The Mets brought in the 12-time Gold Glove winner to work on Mazzilli's defense and teach him the famed basket catch. 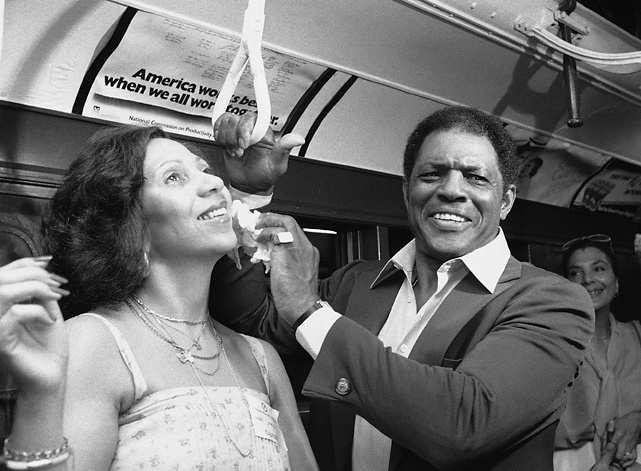 Mays wipes sweat from his wife's face as they ride the "A" train to the former sight of the Polo Grounds, the long-time home of the New York Giants. The Colgate women's games paid tribute to Mays on Aug. 2, 1979, the day this photo was taken. He was inducted into the Hall of Fame three days later. Mays holds his plaque as he waves to the crowd at Hall of Fame induction ceremonies on Aug. 5, 1979 in Cooperstown, N.Y.
Willie Mays kisses his wife Mae after signing a long term contract with Bally Corp. in New York on Oct. 29, 1979 as Bally executive William S. Weinberger looks on. Forced to choose between the game he loves and a lucrative contract to work for an Atlantic City, N.J., hotel and gambling Casino owned by Bally, Mays announced he would terminate his active relationship with the sport. Willie Mays, Mickey Mantle and Bob Gibson discuss their sport on ABC's Good Morning America broadcast on Dec. 27, 1982. 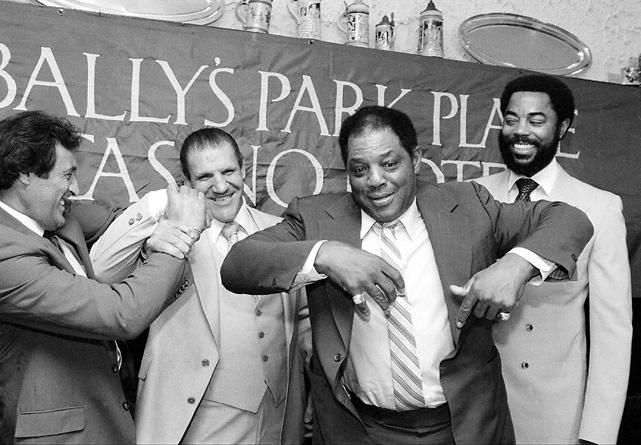 Mays jokes with other former athletes promoting the "21" Club's second annual Greatest Sports Legends reunion in 1983. Joining Mays were former hockey player Phil Esposito, wrestler Bruno Sammartino and basketball player Walt Frazier. Willie Mays pulls out his retired jersey at a press conference in San Francisco on Wednesday, Feb. 13, 1986, announcing his return to the San Francisco Giants as special assistant to the club's president. 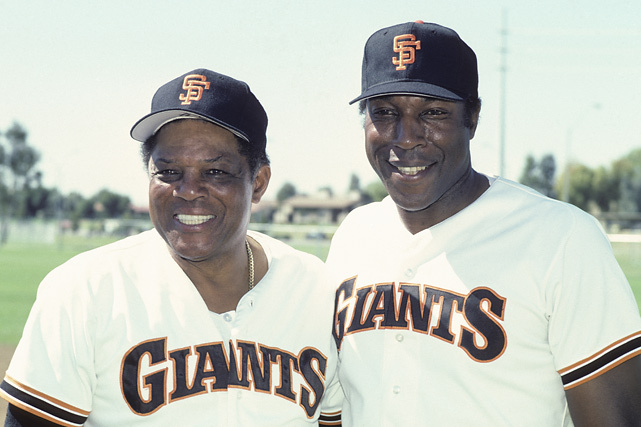 Mays poses with fellow Hall of Famer Willie McCovey during spring training in March 1986. Mays has been a special assistant for the franchise since that season. 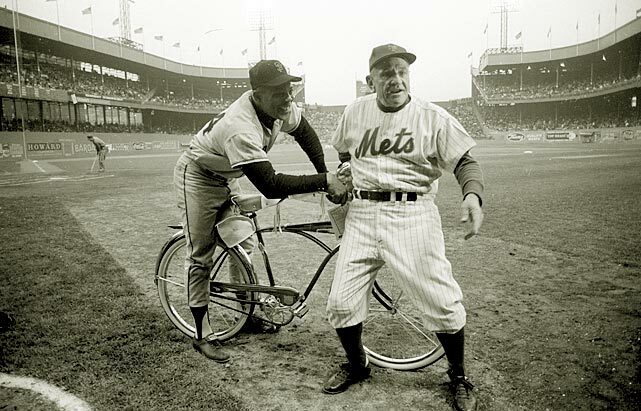 Willie Mays clowns around with Luke Appling before an Old Timers Baseball Classic at R.F.K. Stadium on June 23, 1986. 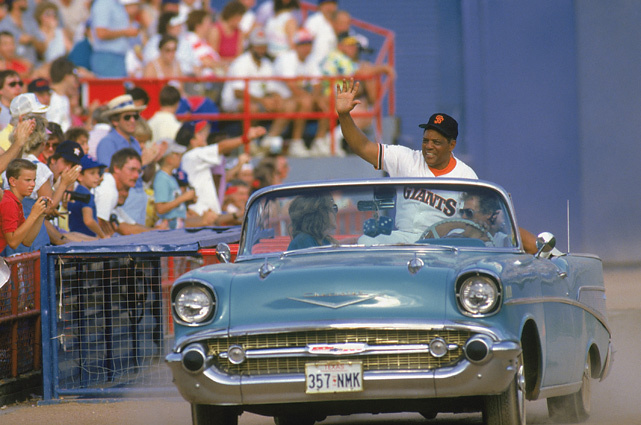 Mays rides in a convertible, waving to cheering fans, at the Giants' Old-Timers Day in 1988. Hank Aaron and Willie Mays attend the private screening of the movie "Tron" in New York City in July 1988. Willie Mays accepts a tributary award from actor James Earl Jones during taping of the Baseball Relief: An All-Star Comedy Salute on Saturday, Oct. 3, 1993 in Pasadena, Calif.
Willie Mays, Bobby Bonds, Andre Dawson and Barry Bonds pose during a ceremony honoring the exclusive four members of the 300 home runs/300 stolen bases club on April 28, 1996. Willie Mays speaks with actress Brooke Shields prior to a San Francisco Giants game against the Colorado Rockies in June 2002. Mays and Mickey Mantle on the July 14-July 21, 2003 SI cover. 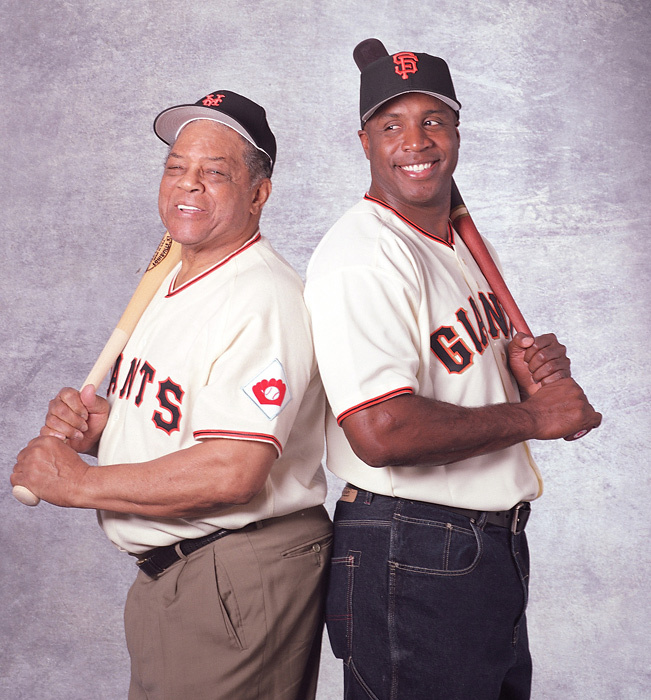 Mays poses with his Godson, Barry Bonds during a 2004 SI photo shoot. Actor Bernie Mac and Willie Mays attend the premiere of Touchstone Pictures' "Mr. 3000" on Sept. 8, 2004 in Los Angeles. Willie Mays uses his hand to chop through a large birthday cake presented in honor of his 75th birthday on May 12, 2006. Giants' Jose Vizcaino, left, laughs and former Giant and current broadcaster Tito Fuentes, center, applauds. Greg Norman, international team captain at the 2009 Presidents Cup golf competition, looks on as former baseball great Willie Mays flips a coin for the start of the second round. Mays, Billie Jean King and Harry Belafonte are presented to the crowd prior to the 2010 MLB Civil Rights game between on May 15, 2010. Nick Buoniconti, Willie Mays and Bill Russell attend the 25th Great Sports Legends Dinner on Sept. 27, 2010 in New York City. Willie Mays throws out a ceremonial first pitch before Game 5 of baseball's National League Championship Series between the Philadelphia Phillies and the San Francisco Giants on Oct. 21, 2010, in San Francisco. Willie Mays waves as he rides in the Giants World Series ticker-tape parade in November 2010 after they defeated the Texas Rangers in five games for their first championship since the team moved west from New York 52 years ago. Willie Mays looks over his 2010 World Series championship ring that was presented to him by Giants center fielder Andres Torres on April, 9, 2011. Willie Mays with San Francisco Giants chief executive officer Larry Baer during the San Francisco Giants 2014 World Series Ring ceremony on April 18, 2015. Hank Aaron, Johnny Bench, Sandy Koufax and Willie Mays are introduced during a Tribute to Greatest Living Players before the MLB 2015 All-Star baseball game in Cincinnati. President Barack Obama presents Willie Mays with the Presidential Medal of Freedom during the 2015 ceremony at the White House on Nov. 24, 2015. Broadcaster Vin Scully (left) is congratulated on his final broadcast by Willie Mays on Oct. 2, 2016 in San Francisco.